There is a reason: milestones should always be celebrated, and PC has several today (must be the eclipse): a Guest Post, a book blogger’s review, and a new Amazon review. And yes, I am writing. And yes, it is going well. I’m biting my nails. ARE GOALS A TEMPTATION TO FATE? First, a shoutout to Caleb and Linda Pirtle’s new website, Here Comes a Mystery, which is featuring Pride’s Children: PURGATORY this morning. Caleb nails small town America, among many other things, and Linda writes cozies, also among many other things. A real power couple with a wonderful backlog. Pride’s Children continues to slowly find its tribe as I navigate the waters of marketing and advertising and publicity in my slow way – via Amazon ads, a fascinating can of worms. Who knew (okay, I really did) that writing ad copy is trickier than writing 167K novels? But it is the only SURE way to make progress among strangers, and that’s what PC needs: to come to the attention of people who read similar books, and who may give it a chance. Being in Kindle Unlimited has been good – about half the people who read PC nowadays do so via KU. Sometimes, on a slow week, I get the fun of watching a single reader start – and finish – within a day or so, because Amazon gives me a graph which literally shows pages read. The first chapter is finished. The way I write, when I get to that point, the story on the page is as close to the story in my head as it will ever be, full 3D staging and moving actors. When the next chapter is finished, Chapter 21 (I’m keeping the chapter numbering, of what is ONE story, sequential) will go to my beta reader to make sure I haven’t missed something, and, in my attempt to keep the word count down, I haven’t been TOO elliptical. I have been stalled for a while at the LAST scene in Chapter 22 – the reasons have been physical, and are well documented in my writing blog, and should be of little interest here except that I require use of my fiction writing brain for a usable period of time every day, or progress doesn’t happen. If you want to make God laugh, tell Her your plans? That’s where the question about goals comes from. I sincerely pray the stall is temporary, and on its way out. I wouldn’t be writing this post – which is a promise – otherwise: there are no other goals before me (except one tiny one, almost finished). This is it. Kind fellow writers have suggested I try writing other things as a way back in to NETHERWORLD’s complex storyline, but that’s not how it works with me. I am not blocked; I am stalled. I am waiting for the return of my head writer. Me. Thank goodness there are flashes. Unfortunately, the ability to write coherent blog posts (if you read them, you may actually notice the progress of that coherence returning) does NOT mean I can write fiction. Fiction is the Queen of writing, and requires the very best you have. I hope she comes back to stay. And no, I don’t really believe that making plans and having goals is tempting Fate. I think they are just necessary to Life. On the other hand, when all this started happening that I’m NOT talking about here, I had figured out how to produce finished scenes about an order of magnitude faster – whew! So it won’t take fifteen years this time. Recommend Pride’s Children: PURGATORY to all your friends – it’s very encouraging to see sales, and borrows from KU. Thanks to Stencil for the ability to take a few thoughts and produce a graphic – it’s become a haiku-like experience. The easiest way is to Follow me on Amazon – you will be notified ONLY when a new book is available. I plan to write more here about the books, and some followers may prefer to not have that background; if you are not interested in the extra material, unsubscribe from this site, and Follow on Amazon. With a long novel, and me not being one of the people who count their drafts in words written (so I can’t put up a progress bar), it is easy to wonder if the writer is on permanent vacation (certain fans of GRRM – to whom I’m certainly not comparing myself – will know what I mean). Complexity takes more time to set up, and more time to write. NETHERWORLD has turned out to be significantly harder to get started than I expected, and I’m barely nearing the end of Chapter 1, but a lot of the time since I started writing it in early 2016 has been spent on setting up timelines and plotlines in great detail so that I hope not to have to find out about plot holes the hard way (when Rachel, my lovely beta reader, asks one of her incisive questions). I’m pretty sure it’s going to go a lot faster from here on (though I may have to slow down a bit at the end to make sure the ending is just right: finishing off a part of the story and setting up the remaining book of the trilogy). Now that the election is over, writing (which I’m doing instead of following it) has become a refuge, and an easy place to spend my time. You may be interested in a post on my writing blog about the process, There is always a new writing fear. And, be assured, I am hard at work. I know where it goes and how it ends, but not the words. And the words, built on a solid structure, are the best part for the writer. So much to do, so little time, so little brain! 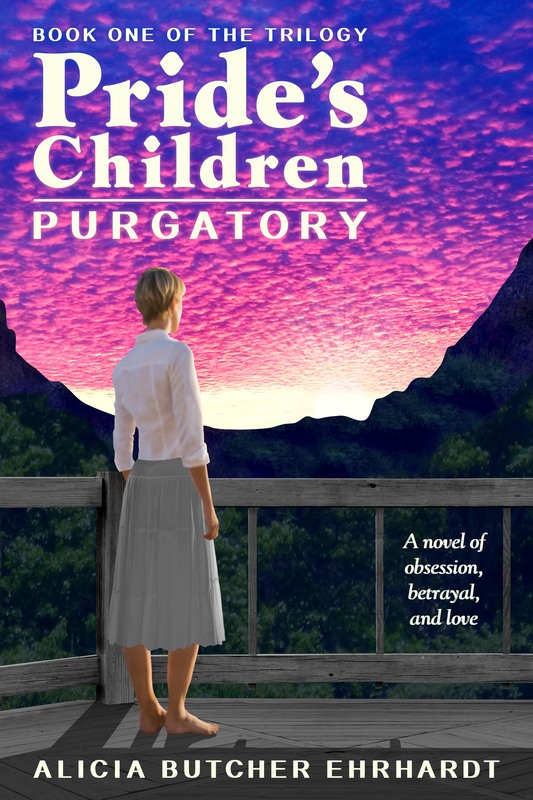 If you liked Pride’s Children: PURGATORY, the ebook is on sale in the US and UK until Oct. 18 and 19 respectively, for 0.99. Please recommend it to your friends who would like it, as I go forth renewed by time off with family, and hope to get NETHERWORLD finished sooner rather than later. PC is up to 25 reviews (including 3 critical ones! ), and I would dearly love more so I will be accepted by some of the promotional ebook newsletters. You can also vote reviews up or down if you like or dislike them. I am delighted to hear whatever a reviewer has to say, though I can’t promise the slightest deviation from the track that has been laid down to finish the trilogy – I’m that stubborn. I love seeing how each reader finds a different book. My entire life is about to change again: the last chick is leaving the nest, probably for good now, and my time will be divided between finding a permanent home for the rest of our life (gulp! ), and writing. The former task includes getting a house ready for sale. If you’ve done it, you know what that means. If not, I don’t think I can explain what disrupting your entire system – even for a long-term benefit eventually – does to a writer. What I have so far – and I’m cagey because my process is extremely erratic, and I won’t make promises I can’t keep – has gone, ultimately, better than expected. Not in speed, but in satisfaction from tackling the new challenges and resolving them. ‘Good’ will be decided by readers. But I have to finish it first. In the summer of 2007, while Pride’s Children was under development, and I had an initial rough draft based on the original Dramatica storyform, life handed me an opportunity, and I grabbed it. My daughter and three of her friends had been offered an internship at LaSalle University after they won, as homeschoolers, an important science competition. The prize was offered and supposedly won (the university probably expected it to be won by some high school group at an actual school), but the four of us mothers who were the homeschooling parents had to do a lot of pushing and prodding to get the internship to happen. Finally we came to an agreement: the school would let us live in the dorms during the summer (they were empty), and arrange some daily time at one of their science labs, and there would eventually be a paper presented by the professor and having the girls’ names on it, at the American Chemical Society meeting. I leave off the ACS details and the prof’s name because they never fulfilled that part, despite all our phone calls and emails after the internship ended. Three weeks were chosen for this internship, and I claimed the right to be the parent chaperone. We would drive down to Philadelphia on Sunday night (one Monday because of the 4th holiday), settle into the dorm, the girls would have their internship during the week, and I’d drive us home Friday afternoon. What did you do with YOUR time, Alicia? I had unbroken time to think. And I used it to do the Grand Reorganization of the plot for all three volumes of the story. Every impossible plot step and twist to turn the implausible story of Andrew and Kary and Bianca into an inevitable and utterly believable end was locked down during those three weeks, in as tangible a form as I was capable of. Everything that had to happen was examined with a microscope, prodded, probed, and declared viable – or eliminated. Pride’s Children, the full trilogy, runs on a business management principle: the critical path, which I have modified for my own purposes to mean that each plot step must be the shortest and tightest way to the next, in an unbroken chain from beginning to end. Nothing happens without it being an absolute necessity (in my mind and my story). Theme and casting notes, please. Michael: Adam Baldwin as Jayne Cobb – big, tall, smarter than he looks, not as smart by far as he thinks he is. Comparison to Laura Hillenbrand there, too – if she can do Seabiscuit, I can do PC.